Rittal has perfected the industrial modular enclosure concept with the TS8 modular enclosure. This revolutionary system is designed specifically for demanding industrial applications. Featuring a 16- fold tubular frame and multi-level mounting, the TS8 boasts unsurpassed strength and flexibility.The robust tubular frame can hold weight loads up to 1,500 lbs on the mounting panel. The 25 mm hole pattern allows components and accessories to be mounted in three directions – by height, width and depth – which provides maximum space utilization (up to 30% more available space than traditional NEMA style enclosures of equal dimension). The symmetrical frame design makes suiting in a row, into a corner or even back-to-back simple. Accessories, such as the ergonomically-friendly comfort grip handle and modular cable entry base, provide solutions for virtually any modular enclosure need. The industry’s most extensive accessory range offers options for almost any use imaginable. Rittal introduces the 1 and 3 day program. They will ship cabinets and accessories selected, ready to configure, in 1 or 3 days. 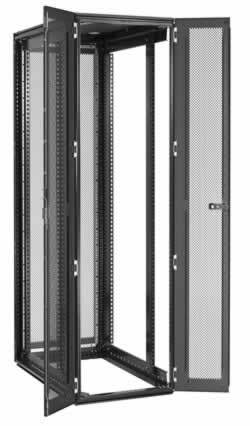 Fully customize your server rack by choosing your cabinet size, sidewalls, front door, roof and other rack accessories.